US, 1977, 114 minutes, Colour. Jack Lemmon, Lee Grant, Brenda Vaccaro, Joseph Cotton, Olivia de Haviland, James Stewart, George Kennedy, Darrin Mc Gavin, Christopher Lee, Robert Foxworth, Kathleen Quinlan, James Booth. 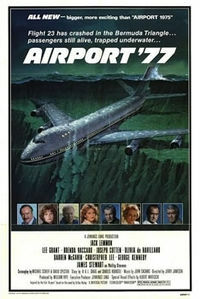 Airport 1977 was the third in the series that began in 1970 with Airport, based on the Arthur Hailey novel. It had an all star crew and passenger cast and this continued in the sequels. The characterisation is that of soap opera; the crises also. There is some interest in the techniques used for raising the submerged Jumbo jet. Typical of the popular entertainment in the disaster genre in the '70s. 1. An entertaining disaster film? The popularity of the genre? Audiences interested in the life of the wealthy? Technology? Dangers? Responding to crises? Identification with characters and situations by the audience? 2. Universal Studios production values? Panavision? luxury? Technology? The range of the stars? 3. The world of soap opera - how credible? Enjoyable? opera? 4. The opening with the set-up for the robbery? The personnel involved, their contacts with pilots and staff? The execution of the robbery? The takeover of the flying of the plane? The gassing of the passengers? The wing hitting the pylon? The crash and the sinking of the plane? 5. Jack Lemmon and Brenda Vaccaro as pilot and hostess? Their style to enliven their characters? The personal background of their story, relationship, mutual help? The pilot and his skills, the technology of flying the plane, computers? The assistant pilots? The pilot deciding to go up to the surface and participate in the rescue? 6. Philip Stevens and his wealth, art, the interviews, his concern, his daughter and her son, personal themes? 7. The crew and personnel, their skills, work? The designer of the plane and his participation in the rescue? 8. The sketch of the passengers and their characters? The Wallaces and their relationship, tensions, Karen taunting her husband, financial deals, her relationship with Frank? Martin Wallace and his scuba expertise, his going with the pilot, his death? Her hysterics? Mrs Livingstone and Dorothy, the southern genteel touch, her poker-playing, her friendship with Nicholas? Dorothy's death? The range of characters, adults, women and children? The business people? Doctors and art critics? Their behaviour in the crisis? 9. The crash situation, the Coast Guard, the Navy, the strategies for raising the plane and the rescue? 10. Popular '70s entertainment? Basic human themes with perennial appeal?